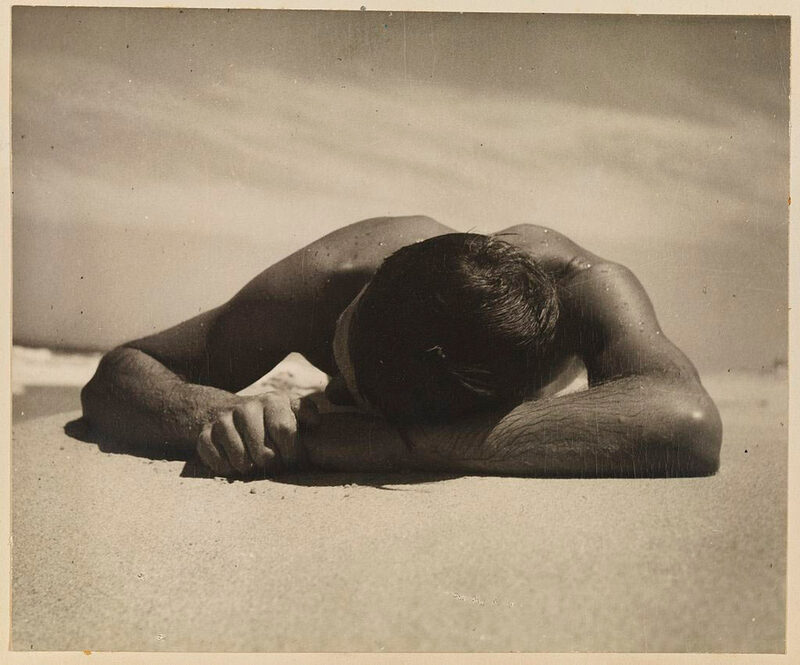 The famous Max Dupain photograph of the the sunbaker was taken in 1937 and ultimately became an icon of Aussie beach culture. Some argue it’s the most famous photograph ever taken in Australia. In fact, this is not the image you think you recognize, it’s an alternative shot and the one preferred by Max himself. It is slightly different from the famous one, the hand is clenched and the horizon is lower; the camera was a little higher. In the better known version the open hand is relaxed and there is more of a feeling of drowsiness and immersion in the sensuality of the moment. Notice how the the hot sand swallows the body which is more abstract and monumental. The foreground blur echoes the dreamy state of the figure. You can see this great image at the excellent Max and Olive exhibition at the Ian Potter Museum at Melbourne Uni. Hurry, it closes on July 24.
Who was the anonymous man in the picture who has come to symbolize so much? Well, ironically he was not an Australian. He was Harold Salvage, an English builder, and a member of Dupain’s circle of friends. The occasion was a 1937 camping holiday with about eight others at Culburra Beach on the south coast of New South Wales. You can see more photos on this Pinterest site which are from an album owned by one of the circle, an architect named Chris Vandyke. It shows a very physical Dupain along with male and female friends having a very good time. Seeing this photo of a fit and happy Dupain with his friend Salvage alongside, it makes sense that his father George ran the progressive Dupain Institute of Physical Education. For more on this part of the story, see Isobel Crombie’s book Body Culture which explores the ideological background to the physical culture movement in the thirties, and hence to Max’s own photographs. 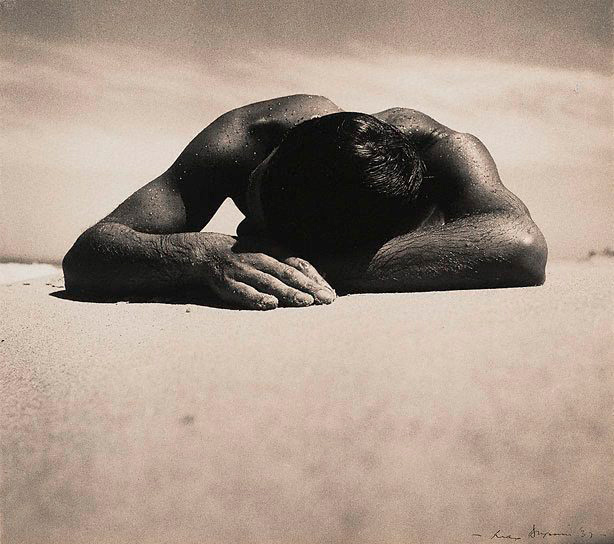 Finally, a print of Sunbaker is currently on show at the excellent Max and Olive exhibition at the Ian Potter Museum. You won’t regret going to this show.